A chilly Gwalior welcomed us after a hectic drive from Shivpuri. The temperature here was below 10 degree centigrade, typical of the Northern Indian climate in January. We checked into Hotel Ambassador and decided to rest for the day due to the weather and the temperature only kept going down, creating uneasiness to our little one. As he started to catch cold, he became more uncomfortable and woke up from his sleep crying loud. We tried to comfort him and gave him the required medicines. As the hotels there did not have a heater installed in rooms, we had no other choice but to request for a separate heater and only wished their response was positive. Fortunately, he obliged to the request and did the needful, which helped us much that night. Our little one felt much better after getting the room heater and slept peacefully for rest of the night. We woke up late the next morning only to realize it was totally foggy outside and decided to stay indoors until the situation improved. We stepped out at around 10.30 am to check out the town of Gwalior, though it remained foggy with a slight drizzle too. 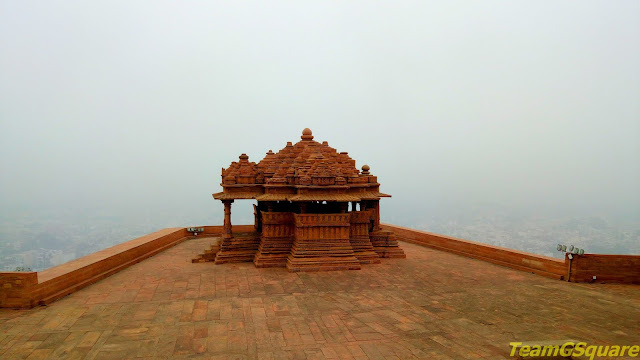 Gwalior always has been in our list of places to visit for various reasons, right from its role in India's first war of Independence to the Nanda dynasty rule of Pataliputra during early 6th century BC. The state of Gwalior rose to prominence with Chieftain Suraj Sen. He met saint Gwalipa who lived on the hilltop where the fort now stands and was cured of his disease by the saint. In return, Suraj Sen founded the city and named it after the saint. 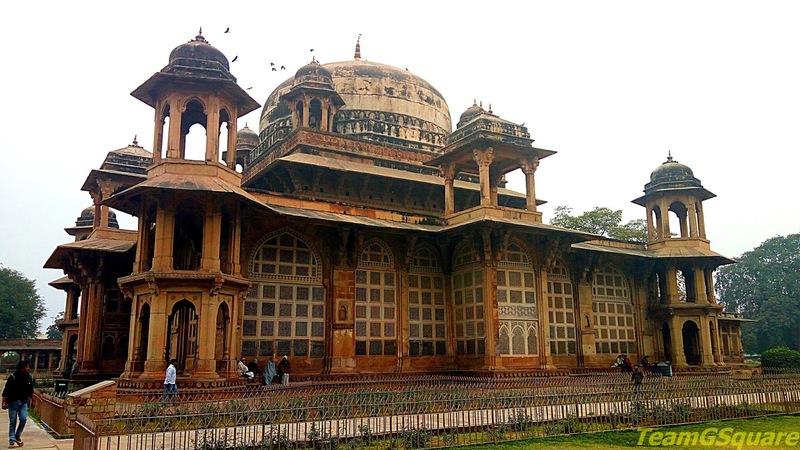 Thus Gwalior was founded. 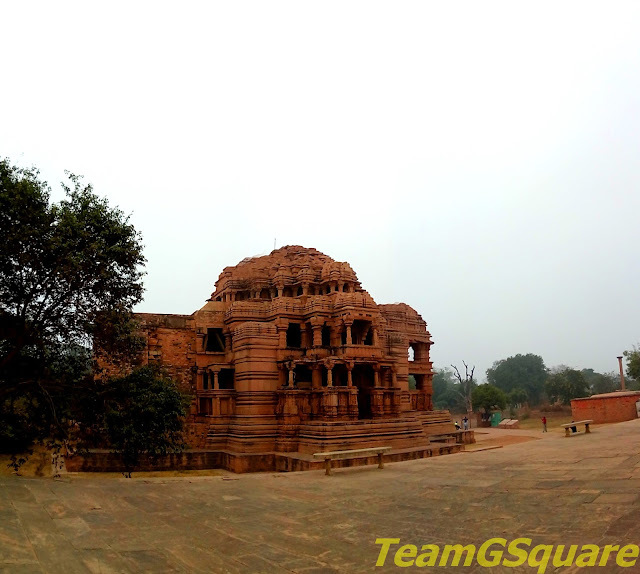 Man Singh Tomar, the great ruler of Tomar dynasty improved the fort here and built the most famous palace of Gwalior, the Man Mandir Palace. Later this fort was captured by the Mughals and remained under them for a long period, after which in 1810, it came under the control of the Scindia dynasty and finally the Sepoy Mutiny of 1857, led by Tantya Tope and strongly supported by Rani Lakshmi Bai. Both the brave warriors gave up their lives during the struggle for independence of this great country. The Scindia Chhatris: The lesser known Chhatri complex of Scindia rulers stands mute in the busy lanes of Gwalior. 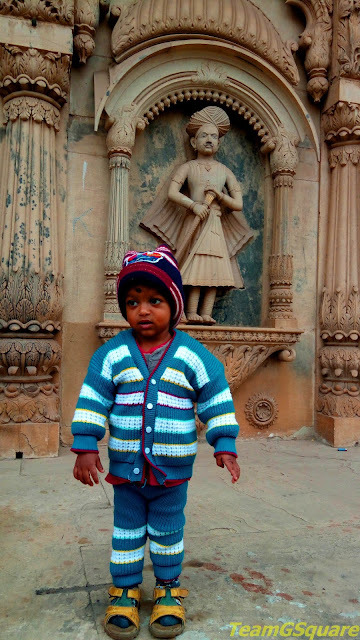 This was the first place we visited in Gwalior and reaching this place was easy. We were greeted by two huge and magnificent cenotaphs. The larger Chhatri was built in 1817 to commemorate Maharaja Jiyaji Rao Scindia and the smaller Chhatri was built in 1843 in memory of Maharaja Janakaji Scindia. 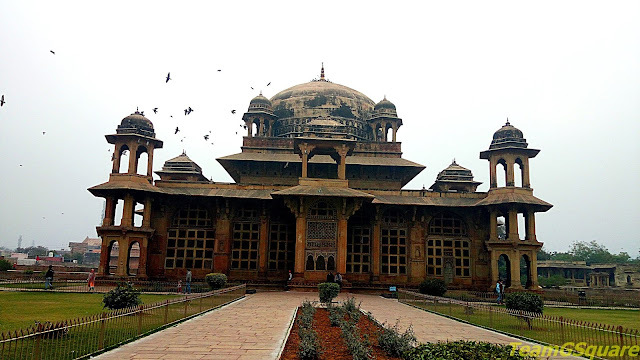 Gwalior Fort: This most impressive structure of Madhya Pradesh is built on a small hillock. Other monuments inside the fort are the Man Mandir Palace, Hathi Pol, Karn Mahal, Vikram Mahal, Gujari Mahal, Shah Jahan Mahal, Jahangeer Mahal and many such. 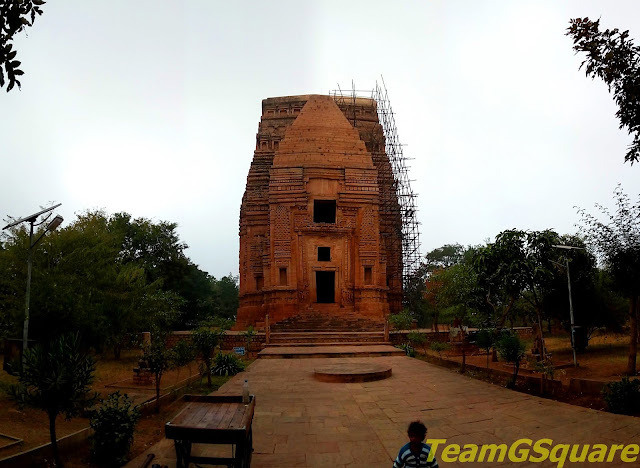 Saas-Bahu Temple (Mother-in-law Daughter-in-law Temple): Built in the 11-12th century by Mahipala Kachhwaha, this temple is dedicated to Lord Vishnu. 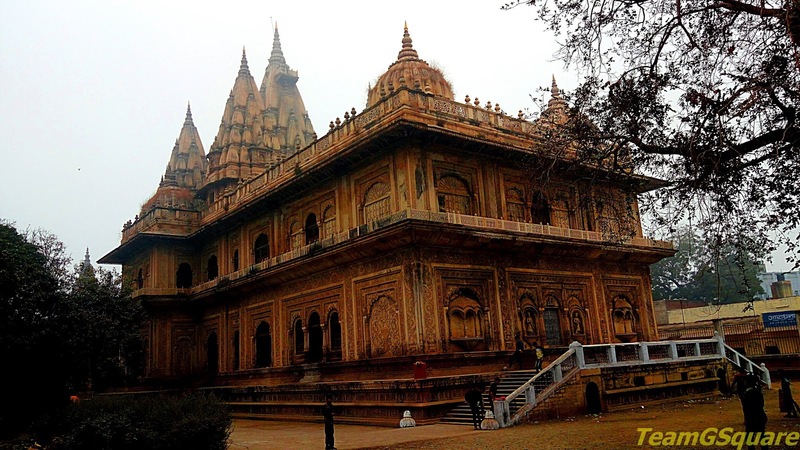 Chaturbhuj Temple: Here is the world's first written zero found! The inscribed slab is believed to be of a much earlier period than the temple which was built by Pratiharas in 9th century. Teli Ka Mandir: This 9th century temple built by Pratiharas is the tallest temple, with its unusual shikhara. Jain Rock Cut Temples: These were built over 800 years, from the 7th century and are dedicated to various Jain Tirthankaras. The tallest murti (idol) here is that of the first Jain Tirthankara, Adinath. 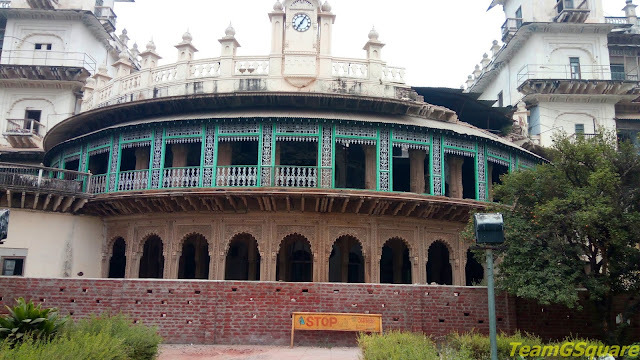 Moti Mahal: This 19th century palace built by the Scindia kings was the Secretariat of Madhya Bharat government back then. There is a beautiful garden with a neatly done network of fountains in front of this palace. Tomb of Mohammad Ghaus: This huge building crowned with a large dome is dedicated to the 16th century Muslim saint Mohammad Ghaus. Tomb of Tansen: It is a small tomb dedicated to the greatest classical singer Tansen, who was the leading singer in Akbar’s court. He was also one among the navaratnas (nine gems). 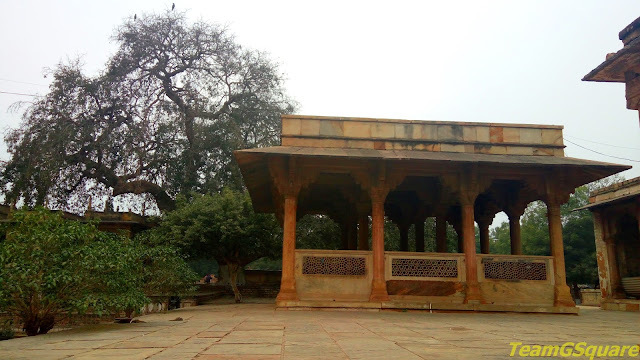 The tomb is in the same complex as that of the Tomb of Mohammad Ghaus and is much smaller in size. The tomb is located besides a tamarind tree, whose leaves were chewed by Miyan Tansen for a sweet voice. 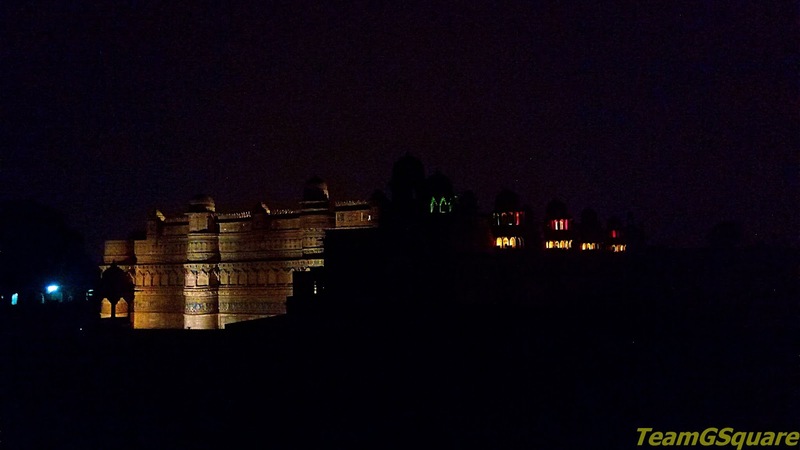 Light and Sound Show: Every evening the MPSTDC runs an hour’s light and sound show at the Man Mandir Palace inside the fort in the two languages of Hindi and English. 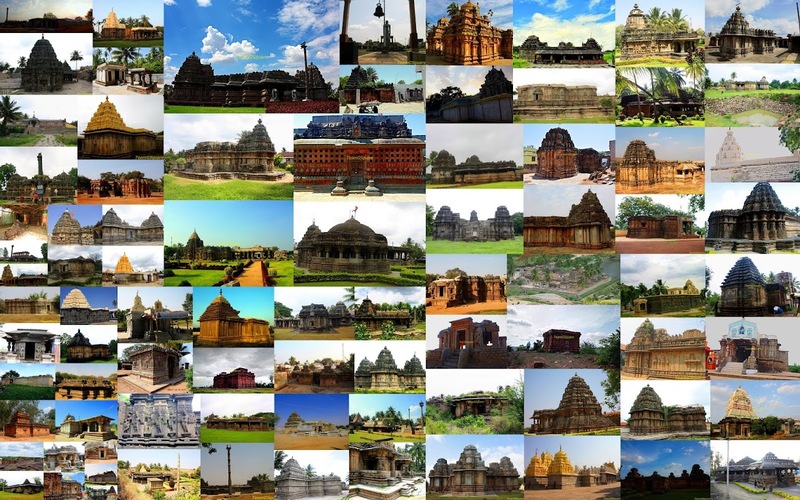 Others Places to Visit: Jai Vilas Palace Museum, Nag Dev Mandir, various parks, and many more. Accommodation:- We stayed for a day at Hotel Ambassador which offered very basic amenities and held a decent and friendly staff, though not very clean. Our second day accommodation was at Hotel Shelter, a bit upscale hotel with nice ambiance, centrally located, mid-range and friendly staff. Being a popular tourist destination, there are many options tailored to meet the varying budgets. Hotel Tansen Residency is another good one being maintained by MPSTDC. Where to eat: Options are many. There should be no difficulty in finding a suitable place for meals. Gwalior has always been in my wishlist. Glad to see your post. Very useful information. Nice photos. Wow, all of the sturctures look stunning. Really intrigued with the Saas Bahu temple, it sounds very unique. You are so lucky, to live in the best country in the world. Beautiful architectural. 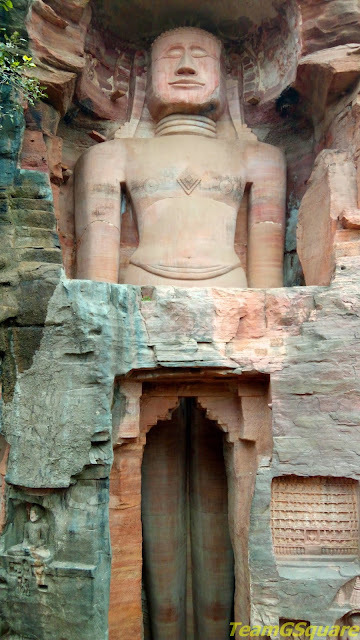 Wonderful Photos of the stunning structures..
Having stayed in Gwalior for a good 5 years I feel more connected with your post. Beautiful captures and very informative text. Keep posting more. Gawalior is in my places to visit list, hopefully after monsoon season. Loved the blue tiled picture. Marked your post for reference.